Sign up for free and just shop with Watch Shop as normal. Our average member earns over £300 cashback a year. Watch Shop cashback can be earned simply by clicking through to the merchant and shopping as normal. Watch Shop Cashback is available through TopCashback on genuine, tracked transactions completed immediately and wholly online. Cut the cost of buying watches and jewellery with these Watch Shop discount code and cashback deals. Not only are they the UK's number one retailer of designer watches, but they are official stockists of all the brands they sell, meaning their range features thousands of in-stock men's, women's and kids' timepieces. Visit the sale section of the Watch Shop website if you are looking to make great savings when you buy online, while they offer free standard delivery with all UK orders, or you can buy online and collect from a Goldsmiths store. Their price match promise means you can be sure of getting a good deal, while you can earn rewards every time you buy, which you can redeem against your next purchase. Use our Watch Shop voucher code deals to save money when shopping for famous watch brand names such as Fossil, Michael Kors, Casio and Armani. Search for fashion and sports watches by the likes of Tissot, Hugo Boss and DKNY, whether your preference is for gold or stainless steel models, while when it comes to jewellery, their collection includes bracelets, earrings, necklaces, rings, charms and cufflinks from designers including Swarovski, Links of London and Thomas Sabo - ideal if you are looking for gifts or great accessories. Sign up to TopCashback using the form further down this page and start saving now. Want to save time? Rather than waste time looking for a working Watchshop discount code, why not simply shop through TopCashback and get your order for less. Plus, if you’re looking to save further, you’ll find hundreds of discounted lines across the Watchshop site, but to make it easier you can browse all the reductions in one place by selecting the sale section located in the menu. Here you can filter down all items on offer, whether it be via discount amount, price range or category, and you’ll usually find price cuts of up to 70% off. Reduced lines are continually changing, and it’s best to get subscribed to the Watchshop’s email newsletter to stand a chance of securing that watch you had an eye on for less. Additionally, shoppers can seek out a clearance area, hosting tons of end of line bargains, and an extra saving is to be had on delivery, with free next day unlocked when spending £60 plus. Whatever you use our Watch Shop discount to buy, they offer free standard delivery on all orders, with items usually arriving the day after dispatch, although it could take a few days. Orders of £60 and over qualify for free express delivery, which will see your items arrive the day after dispatch. You can also choose to have your order delivered before 9am the following day for an additional charge. Order by 4pm and it will be sent out the same day to be delivered the following day (excluding Sundays and Bank Holidays), while orders received just after 4pm are often dispatched the same day, though they cannot guarantee this. Orders sent out by 4pm on Friday will be delivered the next day, while orders over £60 placed before 1pm on Sunday will arrive on Monday. If you place an order on a Bank Holiday, it will be dispatched the next working day. Once your order has been dispatched, you will be sent an email containing a tracking number (if applicable) so you can track it online. You can have items delivered to a chosen Goldsmiths store within 48 hours, though if you order before 4pm, they will usually arrive the next day. If your order is going to take longer, they will contact you by phone or email, while you will also be contacted by email or phone to arrange a convenient time for you to collect your order. Just buy online as normal and find your nearest Goldsmiths store before you pay. When you collect your order, you will need to take a copy of your order acknowledgement email, a valid form of photo ID and the payment card used to make the purchase. Not only can you save with our Watch Shop promo code deals, but you can also get money off by earning Reward points, which you can redeem against future online purchases at watchshop.com, each time you shop. All you will need to do to activate Reward points is complete the account registration process. They will be automatically redeemed against your next purchase if you are signed into your account, meaning you cannot build them up. They cannot be transferred or redeemed for cash, while you will earn points for the total order minus tax, delivery charges and any discounts. Click on 'My Account' and you will be able to see how many points you have and their current value, while any points earned from a transaction will be displayed during checkout. You won't believe it when you clock these fantastic cashback offers when shopping for watches. 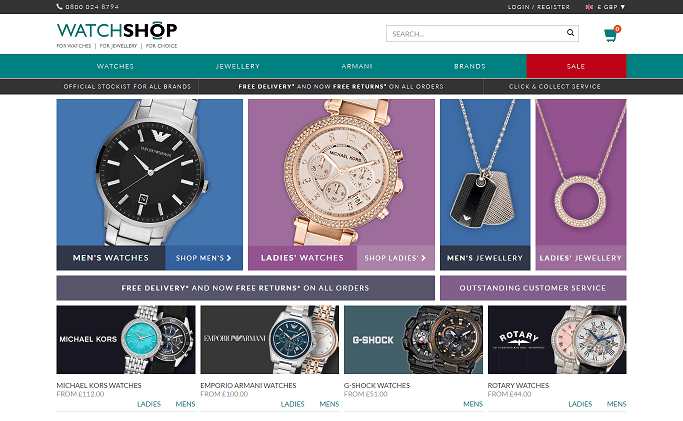 Watch Shop is the UK's number one online retailer of designer watches. As an official stockist of all brands, they offer watches for men, women and children from famous names like Michael Kors, Tissot, Hugo Boss and DKNY. They have over 100,000 watches in stock and show the stock level of each item on their website. They offer free delivery and 30-day returns on all orders, and there is a click and collect service available.